Presented in cooperation with Greg Schlueter and JP2Journey.com: The JP2 Generation Tells Its Story, remembering World Youth Day 2002 and the impact of Pope John II. The second day of our World Youth Day pilgrimage was one filled with great hope and anticipation. As we boarded the buses that beautiful, sunny morning, one could hear the excitement in our voices. We were all so eager to experience the Catholic Church in such a concrete and powerful way! The actual thought of having the youth of the whole world united together in prayer and song, in one place, with the Holy Father— UNBELIEVABLE! But we definitely BELIEVED IT, and we were thrilled to say the least. As the buses filled with songs, chants, and prayers, our hearts were filled with undeniable JOY. For myself, I remember thinking that I was experiencing a dream coming true, and we were just getting started! Participating in Mass was one of the most peaceful moments of day two of our journey. It was such an honor to receive our Lord in the Eucharist in such a beautiful and holy place. The Church was a reminder of Heaven and brought so much peace to our hearts as we gathered together to pray. In that moment we were united as one body in Christ in a very special way. The songs we sang echoed throughout the church, and the light in our hearts proved ready to shine out to the world. With Christ now dwelling within us, we were ready to continue on our way to our destination. When our buses finally reached Toronto, there seemed to be a second wind of the Holy Spirit. The day was coming to a close, but the night was just beginning. As we got all of our belongings situated, our hearts couldn’t help but grow more and more in anticipation to meet Pope John Paul II. We were so close now! But first, we needed to prepare our hearts with MORE FUN! We gathered in an auditorium to lift our hearts and voices once again; this time with Jesse Manibusan! He joyfully sang out to God and got us pumped up for our faith, reminding us why we were here and what we were about to experience. He left us all with smiles and a conviction to be Christ to one another. More importantly, he left us singing “Here I Am, Lord”, encouraging us to give our lives to Christ and to follow him without reserve. For Jesus says, “I am the light of the world; whoever follows me will not walk in darkness, but will have the light of life” (John 8:12). And we did just that as the night came to a close. We had danced, laughed, sang, and prayed like our life depended on it, holding nothing back. As the darkness came upon the day, the light of the Holy Spirit enflamed the diocese of Erie. We were now ready to “be a light unto the nations” and spread His love to the world. My experience of World Youth Day 2002 impacted my life in more ways than I could ever fully explain. I had never really understood the power and wisdom of our Church until seeing our Holy Father, John Paul II, face to face. To be in the presence of such a holy man was an honor and a blessing — one that I am still grateful for to this day. His witness to us, the young people of the Catholic Church, inspired me to live out my faith more radically and to embrace the will of God every day. After graduating St. Mary’s Area High School, I looked to further my journey of faith by attending Franciscan University of Steubenville, where I studied the teaching of the Church more in depth as a Catechetics Major and Theology Major. I remember sitting in class reading JPII’s encyclicals and picturing His joyful face driving by in the “Pope-mobile” at WYD. I prayed for the day to come when I could see him again, and amazingly enough, my prayers were answered — just not in the way I was expecting. While studying abroad in Austria in 2005, we got the news that John Paul II was not doing very well and was hospitalized in Rome. So of course, living on the edge of faith, we all jumped in buses and traveled south to Italy. While we were there, God provided us with an amazing opportunity to pray for him in the hospital chapel, and send a spiritual bouquet up to his room. As we left the hospital, filled with the Spirit, we could not help but start singing praise and worship as loud as we could, giving thanks to God for the gift of JPII’s life. Little did we know it at the time, we were right under his window and he heard every word! And although we didn’t see him in person during our hospital visit, we were blessed to be with him again at his viewing in Rome after he went home to our Father. Being with John Paul II in his last moments on this earth were overwhelming and awe-inspiring to say the least. His memory will go on in my heart forever. Since graduating from Franciscan, God has blessed me in my vocation to marriage with a loving husband and a beautiful 16-month-old baby girl, who both love Jesus and lead me closer to Him every day. Within the past 2 years, God has called us to minister together not only in our work as youth ministers on Long Island, but also in our family life by starting a Family Prayer Community entrusted to the intersession of John Paul, The Great. So we are anticipating his Beatification and the honor of calling him “Blessed”…for he has truly blessed our lives and so many others! John Paul, The Great….. Pray for Us! Stephanie “Kerchinski” Muhs lives in Amityville, NY with her husband, Anthony, and their daughter, Maria Grace. 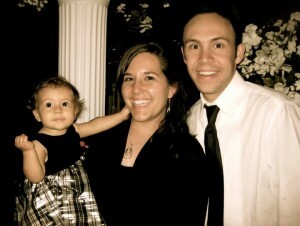 She is the Director of High School Youth Ministry at St. Rose of Lima Parish in Massapequa, NY, alongside her husband. She also leads liturgical and praise and worship music for their Life Teen Youth Mass every week and various events throughout the Diocese of Rockville Centre. For video of WYD 2002 to accompany this story, please visit: JP2Journey.com. Greg Schlueter is an award-winning Catholic film producer, writer, speaker and movement leader. He is President / CEO of Image Trinity, a Catholic, non-profit organization committed to families living their identity and mission (http://ImageTrinity.com), and it's ecclesial outreach, Mass Impact, which is committed to parishes becoming dynamic communities of missionary disciples (http://MassImpact.us). Greg lives with his wife and six children in Toledo, Ohio.